What is Airless Paint Spraying?. Home » Blog » What is Airless Paint Spraying? An airless paint spraying system gives a glass-smooth layer of coating over surfaces that is practically impossible to achieve using a brush or roller. In 1892, Francis Davis Millet is thought to have been the first person to invent a basic spray painting device with Edward Seymour advancing this technique into an aerosol form. Nowadays, there are a number of different systems for spray applying paint, but they can be divided into two types, air sprayers and airless sprayers. Air Sprayers push compressed air into the liquid paint in order to break it up into tiny droplets. This is known as atomisation which can also be achieved by pumping high pressure into the fluid through a small nozzle and it is this method that is utilised in airless paint spraying. There are a wide variety of airless paint spraying machines on the market, but they all have features in common. Basically, an airless sprayer has a pump that forces paint up a hose and out of a spray gun through a very small tip. The nozzle on the end of the spray gun creates a fan pattern of paint onto a surface and the tip size, as well as the pressure level, dictates the rate of paint flow. How Does an Airless Spray Painting System Work? It is viscosity and surface tension that hold liquids together and atomisation dissipates these to produce a mist of droplets instead of a continuous mass of fluid. In airless spray painting systems the energy produced by the high pressure that is injected into the paint is strong enough to achieve atomisation. The paint is pushed through a hose then out of a minute hole in the tip of a spray gun where it exits in a continuous stream under extremely high pressure. However, when it comes into contact with the air it breaks up into a spray of extremely small droplets. It is the size of the orifice in the spray nozzle that determines the amount of liquid that exits the gun as well as the fan-shaped spray pattern. There are a range of tips to control the atomization resulting in different spray patterns and sizes. A range of spray guns can usually be used with one airless system. Airless spraying gun tips are also interchangeable with a variety on the market and they are graded according to the size of their orifice. It is important to select the best one for the job in hand, otherwise the amount of coating spray applied can be either too much or too little. After selecting the most appropriately sized gun tip for the surface being coated, ensure the sprayer is compatible with it. In the main, tip selection will be determined by the coating used. Small tips are best used for light coatings such as stains and enamels whereas thicker coatings like latex call for bigger tips. As long as surfaces are prepared properly and the operator is skilled, the right spray tip will result in a top quality finish regardless of the type of coating. All spray tips will wear over time and checking the level of deterioration is essential for cutting down costs. This is because if a spray tip wears out, spraying will take much longer and this wasted labour and paint adds up. The main reason for tip wear is that all coatings consist of both liquids and solids and the solid particles are abrasive. The level of abrasion is partly determined by the size of these solid particles suspended in the coating, but also some manufactured substances are simply more abrasive than others and latex is one of these. A good spray tip will be made out of a material such as tungsten carbide which is highly resistant to abrasion. The main indication that a tip has worn is a change in the pattern of spray. As a tip wears the orifice enlarges which in turn reduces the size of the fan width. When this decrease amounts to 25%, the spray tip should be changed. If it isn’t replaced the finish won’t be of such a good standard and a substantial amount of paint and labour will be wasted. • Use a straining bag to remove any large lumps of solid which abrade spray tips. • Ensure filters are the correct size. • Use the lowest workable amount of pressure to atomise the coating. • Clean the filter after you have finished spraying. • Blow out lumps of solid by reversing the spray tip to prevent clogging. • Clean spray tips with a soft bristled brush. Nearly all airless systems have a pump which is sometimes known as a lower or the fluid section. Its main purpose is to deliver an even flow of liquid under high pressure, through a hose attached to the spray gun. For this to be achieved, all pumps are fitted with inlet and outlet valves and a piston or diaphragm pumps the paint through the machine when the airless is moved both up and down. An airless pump will either be powered by an electric, hydraulic (liquid under pressure) or a pneumatic (compressed air) motor. Airless pumps that are electrically powered generally have an electric motor that is linked to the paint piston pump. The motor generates a continuous rotation via crankshafts and connection rods where this motion is transferred to the pump. A transducer or pressure sensor controls the activity of the motor which is adaptive in digitally controlled airless units. Airless paint spraying machines may also be air-assisted in that the motor delivers liquid through the system at a lower pressure than other airless units, so the paint is only partly atomised. Total atomisation is completed by the addition of some air. The advantages of this method are that the spray pattern is slightly softer than other finishes and there is a higher paint to surface transference rate resulting in less overspray. Both air-powered and hydraulic systems have linear motors which are most efficient and they require an air compressor or hydraulic pump. They are either electric or petrol fuelled. These two types of motors lead to a more even pressure control as the piston moves at a uniform speed. There are different criteria used for rating airless spray painting machines. These include the number of guns accompanying the system and the maximum size of the tip. Gallons per minute (gpm) measures the flow rate in terms of both the pump’s productivity and the size of the nozzle. A pressure measurement of pounds per square inch (psi) can also be utilised as a way of rating an airless sprayer where the liquid is pumped under extremely high pressure of up to 3000 psi. Most pumps use 300 to 7,500 pounds per square inch which translates as 2,100–51,700 kPa (kilopascal) pressure. This pressure is necessary to atomise the liquid. It is worth remembering that the working pressure at the tip is influenced by the tip size, the length of the hose and the viscosity of the coating used. Horse power (hp) pertains to the performance of the engine driving the airless system and there are a range of airless motors available. It may be tempting to opt for the biggest motor assuming this means more power and a machine that will last longer, but this isn’t always the case. It is best to tally the motor and spray tip with the project in hand. In fact, tip size is probably the most effective way of rating an airless spraying system and working out which one is best for the job will result in an optimum finish. For flexibility, most airless spray tips are interchangeable. The tip size should be chosen according to what the spraying unit is capable of supporting, the type of liquid being sprayed and the resulting amount of pressure necessary for atomisation to take place. A numbering system denotes the size of spray tips where smaller numbers are appropriate for spraying lacquers and stains, slightly larger for enamels and larger still for oil based coatings and interior latex paints. For the most viscous coatings such as latex paints used on exteriors, the largest tips are recommended. Why is it Best to Use an Airless Sprayer? 1. Airless spray units are ideal for onsite paint spraying because they can be transported easily. The motors are not too heavy as they are usually less than 1 hp. 2. This technique is very versatile in that it can be used in interiors and exteriors on a variety of different types of projects ranging from roller shutter doors to huge expanses of metal cladded roofs. 3. 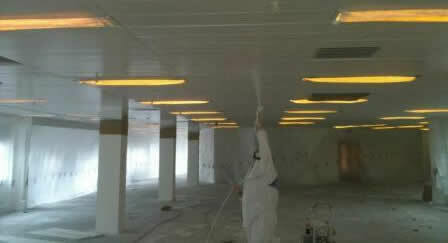 If you want to complete a recoating project quickly, then airless spraying is the method to choose. Paint can be applied up to four times as quickly as with a brush and twice as fast as a roller. This can save up to 75% of labour time. 4. As the airless technique covers large surface areas so quickly, project managers don’t have to wait for long stretches of good weather to schedule in exterior projects such as painting roofs. 5. Not only does the liquid flow out from the gun quickly and easily, it lays paint on a surface evenly unlike brushes or rollers which leave ridges in the coating. 6. The uniform layer of paint produced by an airless paint sprayer is perfect for rough, damaged and textured surfaces such as peeling paint on cladding. 7. The coating is thick, so not as many coats are needed as in other methods. 8. It gives a flawless finish. 9. Unlike the electrostatic method which doesn’t suit water based paints or paints containing metallic particles, any type of liquid can be applied using an airless gun. 10. Because an airless sprayer applies a very ‘wet’ coating, this results in good adhesion and the coating is less likely to fail and more likely to last for a long time. What are the Disadvantages of Using an Airless Sprayer? Not all of the fine droplets of paint stick to the surface when painting with an airless sprayer. A high proportion of the coating ends up being sprayed into the air. In fact, about 20-40 per cent of the paint droplets don’t end up on the surface they were intended for. This is a waste of paint which is therefore money down the drain, however the time saved in labour offsets this cost if the expanse being painted is large enough. Nevertheless, the overspray means that when paint is drifting through the air it can land on any nearby surfaces which obviously should be protected. This results in extra time and effort needed to cover and mask up adjacent items and surfaces in order to prevent them being coated in unwanted paint. It also takes time to clean the airless system after use. Paint must be flushed out of the pump, hose and the filters. Furthermore, the spray gun itself has to be cleaned. If the coating used is oil based then solvents are necessary to clean the system and these need to be bought and then stored. Before using an airless system you need to ensure it is clean. Every airless system is fitted with a screen (where the liquid enters into the system) and removable filters by the pump and in the spray gun. These should all be clean. Filters can easily become clogged up with lumpy coatings, so it is best to stir them well or even strain them using a nylon filter bag before use. The pump must be primed before spraying begins. To do this put the smaller priming tube into a waste container and the suction tube into the paint pot. Switch the spray valve to ‘prime’ and then turn the pump on. Increase the pressure until the paint starts flowing out of the prime tube then place the tube into the paint pot. It is important to make sure that there are no air bubbles trapped in the tube, so let the paint flow until you can’t see any. This should take about thirty seconds. The hose can then be filled with paint. Remove the guard and spray tip from the gun and hold it above the waste container before pulling the trigger. Turn the valve to ‘spray’. As soon as the paint is flowing evenly, let go of the trigger and lock it. Next, the pressure needs to be released. Switch the power to ‘off’ and turn the spray lever to ‘prime’. Hold the gun over the waste container before pulling the trigger which will relieve the pressure. Then lock the trigger. In order to install the tip, firstly loosely attach the guard to the gun at a 90 degree angle. Then insert the spray tip into the gun and tighten it. The pressure must then be adjusted because too little will lead to an irregular spray pattern and undue pressure will increase the amount of overspray as well as wearing out the tip more quickly. To check the pressure, ensure the spray valve is turned to ‘spray’ then test the spray pattern. The pressure will need to be increased if the spray pattern has tails or fingers or if it is uneven. Airless spray painting does create a certain amount of overspray, so any objects and surfaces that you would rather remained uncoated, should be masked with plastic sheeting, paper and tape. It is always a good idea to think about how you are going to tackle the actual spraying of an item before you begin. For the first (or lead) paint stroke, start with the gun aimed off to the side of the item you are painting rather than directly at it and then move it before you pull the trigger to start spraying. Only release the trigger when the gun has gone past the end of the stroke (known as the lag stroke). By keeping the gun moving as the trigger is pulled and released, the surface will not be coated with thick layers at the beginning and the end of each stroke or pass. Whilst spraying, point the gun head on towards the surface and do not tilt it as you are painting. Keep the gun held about 30cm away from the surface unless you are using extremely large tips in which case you will need to move further back. During each pass, move the gun in straight horizontal lines across the surface rather than in an arc whilst the gun is perpendicular to the item being sprayed. Keep the gun moving in a steady motion and only stop moving after the trigger has been released. For an evenly smooth finish experts agree that the overlapping technique is the most successful. For each new stroke, aim the spray tip at the edge of the previous pass and overlap each painted stretch by about 30% to 50% when you make the next sweep with the gun. Different elements call for various approaches. When spraying large expanses including suspended ceilings, begin spraying any of the outside edges then move towards the middle. The middle section won’t need so many meticulous sweeps. When painting medium sized architectural features such as roller shutters a similar, efficient strategy works, so start spraying the edges at the top first then move towards the middle. With smaller doors, begin by spraying the edges then spray up and down followed by another horizontal layer from side to side. Whatever is being recoated, a superior finish will be achieved by spraying on a few thin coats instead of one, thick one especially as thick coats are likely to lead to runs, so don’t paint too slowly. • Cover any surfaces that are not going to be painted to protect them from overspray. If an interior is being sprayed mask walls, floors, light fittings, switches, door architecture and fire alarms etc. When spraying outside paint fog can be carried by the wind, so covering neighbouring surfaces is important. • Make sure you have the appropriate PPE as you will be enveloped in a fine mist of paint. Wear overalls, safety goggles and a respirator during spraying. • If spraying inside, ensure the working area is well-ventilated. • Always read the manual that comes with the sprayer. • Put lubrication oil into the pump before using an airless spray painting machine. • Relieve the pressure before you connect a tip to the gun, after you have finished spraying and before you clean the airless system out. • Stir the coating well before spraying and get rid of large pieces of solid particles with a strainer. • Do not cover the pump with anything because air must be able to circulate around it. • Abide by health and safety protocol and take care when operating an airless spraying machine. Airless guns can cause serious injection injuries as the liquid exits the nozzle at an immensely high pressure. • In order to keep overspray to a minimum, use the lowest amount of pressure possible for atomisation. • Do not tilt the gun in different directions when airless paint spraying as this will result in an uneven coating of paint on surfaces. • When you are not spraying make sure the trigger is locked. • Regular cleaning and maintenance of an airless paint spraying unit will prevent problems since clogging is the most common issue and dried paint can damage the pump. Consequently, ensure filters and spray tips are kept clean and the right sizes are used.